If you have been looking for the best DNA test for your family research project, then this guide is for you. Feel free to share this guide a friend or other family members who’ve been thinking of going on a family discovery journey of their own. Before you start shopping, it’s important to understand that there are three DNA testing services, that can meet the needs of most people and of genealogy professionals. These include 23andMe, AncestryDNA and Family Tree DNA (which I will refer to as FTDNA from here on). All three are very good at what they do. You will get comprehensive and in-depth genealogy results from all of them. All three services maintain massive DNA data bases that allow you to discover new relatives from millions of DNA sets. These similarities and the advertisements on TV can make choosing you first DNA test a bit of a headache – especially if you are new to DNA genealogy. This is I published this buyer’s guide to the big 3 tests. The following table provides a quick comparison of the 3 leading DNA testing services: 23andme, Ancestry DNA and Family Tree DNA. To read my in-depth review, touch ‘REVIEW’ below. I can’t think of anything more personal than sharing your DNA with a company – permanently. Picking a company you can trust is paramount when getting your family tested. 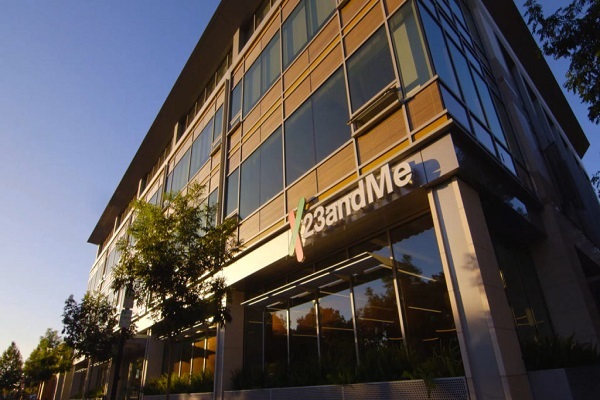 23andMe originally started out as a Personal Genome Service (PGS) provider. Essentially, they tested customers’ DNA samples for disease markers. Ancestry DNA testing was just a small component of their services. This changed in 2013 when the company was ordered to stop marketing its health package until it obtained the required regulatory approval from the FDA. So the company had no choice but to pivot fully to ancestry DNA testing. As for the health part of the test, only raw genetic data could be provided. The moratorium from the FDA prevented them from interpreting the data into comprehensible information for customers. 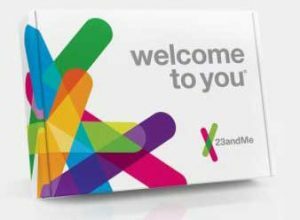 While 23andMe was finally permitted to offer health DNA testing in 2015, they did not stop offering a comprehensive DNA ancestry testing service. Today, you can learn a lot about your ancestry just by submitting a saliva sample to the company for testing. You can find out what ancestry your DNA is made of, trace your maternal and paternal lineages centuries back and explore your roots beyond what you’ve been told by your parents and grandparents. You can even find out whether you have Neanderthal DNA. With over a million people in their database, 23andMe is one of the best services for building a family tree. You can discover new relatives continents away or even in your city. We cover the highlights of 23andMe services, below. If you want to dive deeper, then read my in-depth 23AndMe review. AncestryDNA is one of the biggest and most comprehensive ancestry DNA testing services. They are part of the genealogy company, Ancestry.com. They are an excellent choice if you want to discover your ethnicity and build an extensive family tree. 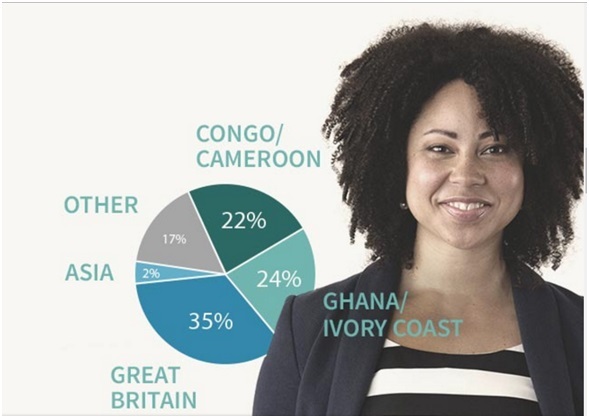 AncestryDNA ancestry testing covers 26 regions and ethnicities. These include 9 African ethnicities, 3 Asian ones, Native American, Polynesian and much more. So however unique your DNA composition is, AncestryDNA will be able to break it down into individual ethnicities. If you want to find out whether you have any undiscovered relatives, AncestryDNA can help too. They have over 80 million family trees in their database, which makes it easy and fast to find people with whom you may have a DNA connection. With over 20 million historical records and DNA test results of more than 5 million people, AncestryDNA allows you to delve much deeper into your family history than any other service. Comparing 23andMe vs. AncestryDNA, one of the biggest differences is that 23andMe offers maternal and paternal lineage tracing while AncestryDNA does not. To learn more about this service, read my in-depth AncestryDNA review. FTDNA offers more comprehensive family matching tools than any other service. Their comprehensive DNA testing services are ideal for ordinary customers who just want to find out where they are from and whether they have any unknown relatives as well as genealogists who find FTDNA’s set of professional tools and in-depth data incredibly useful. 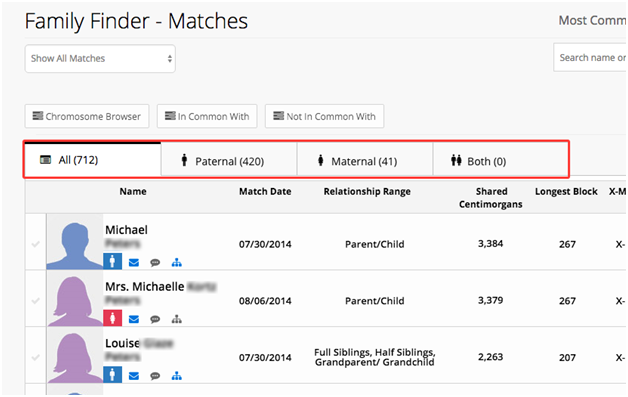 One of FTDNA’s most popular packages is Family Finder. It allows people to discover their ethnicity makeup and create family trees from a comprehensive database of almost a million records. Using the Family Finder tool, you can trace your grandparents up to 5 generations back. FTDNA also provides specific packages for paternal (y-DNA) and maternal (mtDNA) DNA testing. Using these, you can trace your lineage down your mother’s or father’s line. Remember this is not possible with AncestryDNA. FTDNA is my personal favorite thanks to their friendly customer service and ease of use. 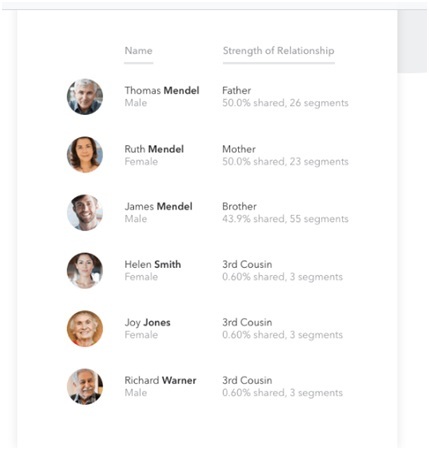 It is so easy to connect with other family members, and you can even transfer raw data from 23andMe and AncestryDNA to their platform for further analysis. Read my in-depth Family Tree DNA review to learn more about FTDNA beyond what we cover in this guide. Let’s look at the different types of tests each service offers and their pricing. All of them are affordable, but it pays to understand your goal for getting tested before shopping, because they each specialize in a different niche. If you are in the US, 23andMe offers two test packages: ancestry testing and ancestry + health testing. For international customers, only the ancestry testing option is available. But you’ll still be provided with raw genetic data that you can upload to FTDNA (or any other DNA analysis tool) for a full health analysis. They offer a single DNA ancestry test to learn about your ethnicity makeup, trace your paternal and maternal lineage and find distant relatives through 23andMe’s DNA Relatives tool. 23andMe’s ancestry test is $99.00 on Amazon.com for US customers. From time to time they also run specials and discounts. 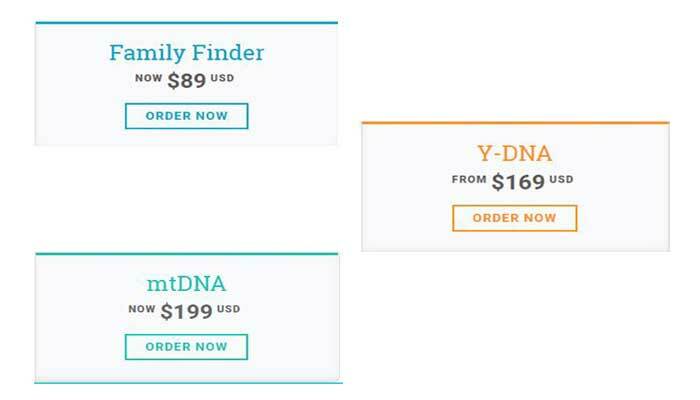 AncestryDNA too offers a single DNA testing package, currently priced at $79. The retail price is $99. In this package, they will test your DNA to find what ethnicities or regions your ancestors came from. They also offer customers the chance to connect with other relatives found in their expansive database. Unlike 23andMe and FTDNA, AncestryDNA does not provide any lineage tracing at the moment. But if you just want to find out what part of the world makes up your DNA or whether you have some distant living cousins, then AncestryDNA is one of the best services for that. Note that AncestryDNA also charges shipping fees depending on your location and the type of shipping you have chosen. Of the three services, Family Tree DNA has the most test options. Customers can choose from different packages depending on what kind of information they need. As for the price, FTDNA’s cheapest package is priced at $69 (retail price is $89). Whether you just want to find your family or you want more in-depth information about your ancestors, FTDNA does it all. The most basic and most popular package is Family Finder. This package allows you to discover your ethnicity makeup, find out where your ancestors came from and how they migrated and connect with people with whom you might share family history. Family Finder may sound basic, but in reality, it is quite comprehensive. For example, it has a tool called ancient origins. It allows you to go even deeper into your ancestral history. Your DNA is compared to DNA collected from archeological sites. If a match is found, you can discover where exactly your ancestors lived, how they lived and how they moved about over time. It also tells you whether you have any ancient Neanderthal DNA in you. FTDNA’s relatives matching tool is also quite exhaustive. You can easily sort and match potential relatives to narrow down to those who have the highest likelihood of having a familial connection to you. If you want to study your DNA ancestry at a deeper level, FTDNA has additional packages that allow you to trace your lineage and even connect with a professional genealogist if you have any questions. Here is the price breakdown of all services provided by FTDNA. Family Finder – relatives matching and ethnicity makeup package for $69 (regular price is $89). Family Finder + Y-37 – Family Finder plus a 37-marker paternal ancestry test. For males only. Costs $198 (regular price is $258). Family Finder + Y-67 – Family Finder plus a 67-market paternal ancestry test. For males only. Costs $337. Family Finder + still Sequence – Family Finder plus a maternal lineage test. For both males and females. Costs $218 (regular price is $288). Family Finder + Y-67 + still Sequence – This is the most comprehensive test, combining all tests into one package costing $430 (regular price is $556). This package is for males only. That’s not all; you can also order the paternal and maternal tests on their own without the Family Finder package. For research into your father’s lineage, there is the Y-37 test ($139 – regular price $169), the Y-67 test ($268) and the Y-111 test ($359). Note that these Y-DNA tests are for males only. If you want to look into your mother’s lineage (for both males and females), there is the mtDNA Plus test for $79 and still Sequence test for $159 (regular price is $199). So the choice is yours. Mix and match the different types of tests until you find the perfect package to discover what you are looking for. As with the other two services, FTDNA also charges shipping fees based on your location and preferred shipping method. For your DNA to be tested and analyzed, you need to provide a sample. Most DNA testing services, including 23andMe and AncestryDNA, request a saliva sample. They use a collection tube to collect your spit. FTDNA is the only one that sends you a cheek swab kit rather than a saliva collection tube. The cheek-swab method may sound harder, but it’s really not. You just swab both cheeks for 30 seconds each. No pain or discomfort at all. Generally speaking, this is a better method for babies and elderly people who cannot generate enough saliva for the other method. All sample kits, regardless of the sample collection method they use, come with extensive instructions to ensure you collect a high-quality sample. For example, they specify what time of the day to obtain a sample. You can access further instructions and videos on their websites. Along with the kits you will receive a prepaid shipping mailer, envelope or label. So you do not have to pay any extra shipping costs to send the sample back to the lab. FTDNA also includes a release form which you need to sign to allow your name and email address to be shared with your genetic matches. 23andMe’s testing process occurs in three stages: sample collection, lab test and results posting. Of course, the very first step is to order your kit. 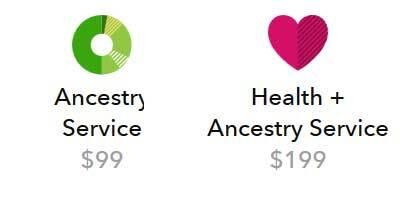 You can buy the $99 ancestry-only kit or the $199 ancestry + health kit. The kit is delivered in 3 to 5 days, though you can pay for expedited shipping. When the kit arrives, all you need to do is spit in the tube provided, making sure you follow all the instructions. 23andMe requires all samples be registered online using a barcode before any processing can begin. The DNA testing process will begin when you mail the sample back using the prepaid label included in the kit. 23andMe uses labs that are CLIA (Clinical Laboratory Improvement Amendments of 1988) and CAP (College of American Pathologists) certified. This means that your sample is tested under the highest quality standards by certified professionals. A custom Illumina HumanOmniExpress-24 format chip is used to check your DNA (what is known as genotyping) in hundreds of thousands of locations for specific DNA variants. This way, the lab can determine your ancestry and ethnicity. They can also be used to check whether there is a connection between different individuals. If you ordered a health test as well, the variants are used to determine whether you are a carrier for certain genetic conditions. It takes around 6 to 8 weeks to finish testing your sample. When the results are out, you will be notified via email with a link to view your ancestry report on a secure online account. 23andMe does not offer any after-sales support services such as counseling. But they have a comprehensive help page with guides on how to use your ancestry report as well as a dedicated forum where customers can ask questions and interact with other customers. You can also contact customer care if you have a question regarding your results. The first step is to order your DNA test kit at Ancestry.com. You can order more than one kit if you have a friend or family member who also wants to take a DNA ancestry test. Delivery time for the kit will vary based on the shipping method you choose and your location. But it should get to you in no more than six days. 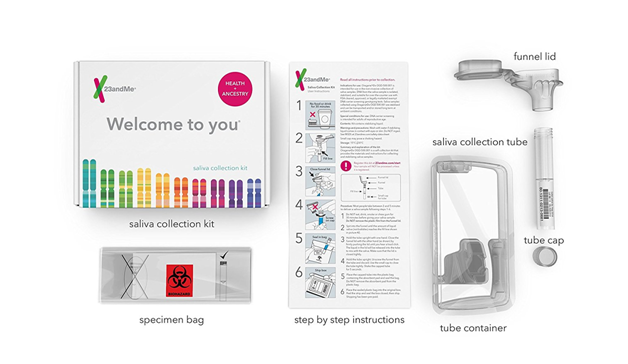 As with 23andMe’s kit, the AncestryDNA kit comes with plenty of easy-to-follow instructions. They tell you how to open the kit, how to spit into the sample collection tube and how to secure it for sending back to AncestryDNA’s lab. AncestryDNA uses autosomal DNA testing to uncover ancestry and family connections. Testing is carried out using the same Illumina chip that 23andMe and FTDNA uses. But AncestryDNA’s chip has been further customized to provide greater accuracy in determining ethnicity and ancestry. The chip checks 700,000 markers or SNPs in your DNA sample to find relevant variants that tell your unique story. Depending on how busy their labs are, testing can take anywhere between 6 and eight weeks. Once your results are ready, you will be notified via email with a link to view the report on you secure AncestryDNA account. AncestryDNA does not provide any special after sales services. For help on anything to do with the test, their website has a lot of guides to help you interpret your results, and you can always contact customer support if you have any question. With FTDNA you first have to decide which of their ten packages you want to buy. The cheapest and most popular one is Family Finder. It includes ethnicity and ancestral results and allows you to build a family tree. Once you order your preferred package, you just need to pay for shipping and then wait for it to arrive. Delivery usually takes between 3 and five days but can be as long as ten days in certain situations. If you want the kit to arrive faster, there is an expedited shipping option though at a higher fee. 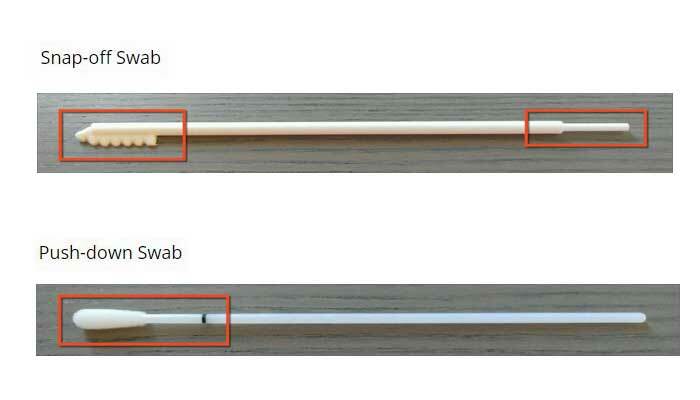 Remember that FTDNA uses a cheek swab sample rather than a saliva one. So make sure you check the instruction on how to open the package, swab your cheeks and to secure the sample before sending it back. 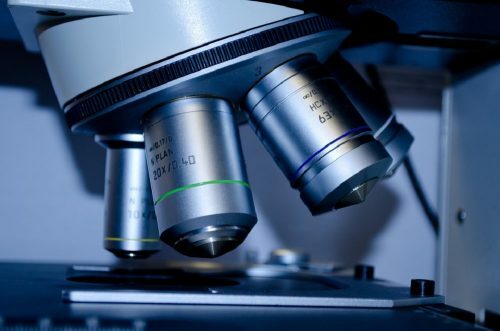 Samples are tested at FTDNA’s Genomic Research Center lab located in Houston, Texas. There, an Illumina OmniExpress microarray chip is used to check over 600,000 markers in your DNA for clues on your ancestry and ethnicity. Different technologies are used depending on what kind of test you ordered. For instance, the method used in an autosomal DNA test (family finder) is different from the one used in y-DNA and mtDNA tests. If you want to learn more about the methodologies and science behind each test type, FTDNA has several expert guides on its website. The basic Family Finder test takes around 4 to 6 weeks to complete. Other tests take around 6 to 8 weeks. Once your kit has been received at the lab, you will be notified, and you can check the date to expect results on your FTDNA account although it’s only an estimate. Most customers get their results sooner. When the results are ready, you will be notified, and you can access them from your secure account. Like the other two DNA ancestry testing services, FTDNA does not send results via email. They are only accessible online. FTDNA, however, provides free printable certificates for certain tests. Because the results are presented online in a digital format, it is much easier to explore the maps and color-coded data than if you were looking at printed reports. The most important part of the ancestry report from 23andMe is ancestry composition. This is the section that tells you the ethnicities in your DNA, who your ancestors are and where they lived. During testing, 23andMe compares your DNA against 31 populations across the world from Africa to Asia to Europe. The ancestry composition report tells you which of those populations you match. In the sample report below, the customer is roughly half European and half East Asian and Native American. The report further provides a further breakdown of those two major groups of ethnicities, giving the customer a precise idea of his DNA makeup. Other sections of the report indicate that the customer also has connections with Sub-Saharan African, Middle Eastern and North African ethnicities. 23andMe lets you explore the results in different ways. The easiest way is using the map view. It shows you a snapshot of regions found in your DNA. For a more in-depth study, you can switch to a list view. There is also an option to see your ancestry timeline. It shows you at what time in history a certain ethnicity (e.g., Eastern European) entered your family line. Using this and the family history you already know, you can figure out which ancestors came from a certain region. So if you were wondering whether your great grandpa was Irish or Asian, you’ll find out using the ancestry timeline. Other important parts of the results include the Haplogroups (allows you to trace ancestry to a specific group of people and region from over millennia ago) and Neanderthal ancestry (tells you whether you have inherited any Neanderthal DNA). The first thing to look at when you receive your results is the pie chart giving you an estimated breakdown of your ancestral ethnicities. For example, it might show you that you are mostly Southern European with some minor North African and Asian components in your DNA. 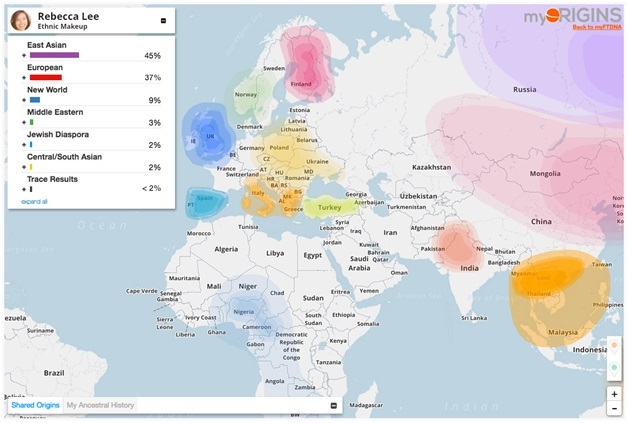 To explore your ancestry further, AncestryDNA provides an easy-to-use ethnicity map. The map highlights which regions have the strongest presence in your DNA as well as the minor ones (what they call trace regions). The best part is that the map is interactive. 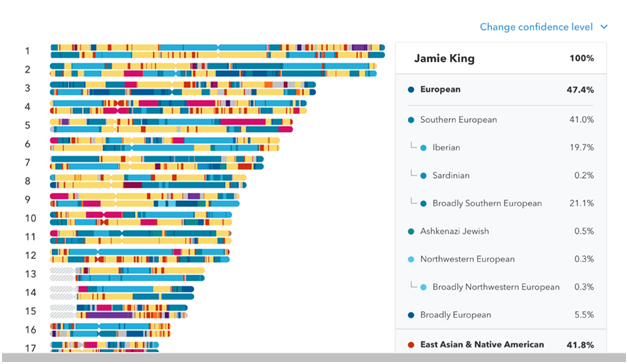 Click on each color-coded area to learn more about what AncestryDNA discovered about your ancestry. The dashboard also allows you to view possible matches found in the database. So if you are looking to build a family tree, this is a good place to start. You can change the confidence level to refine the results to matches that are closest to you. Your FTDNA results will depend on the type of test you bought. Family Finder provides a similar scope of details as AncestryDNA. That is your ethnicity composition and ancestral history. You also get a chance to connect with your DNA matches and develop a family tree. 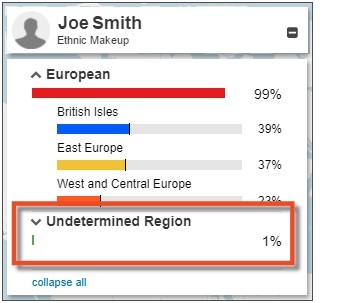 FTDNA calls their ethnicity report my origins. To generate the report, your DNA is matched against more than two dozen population clusters around the world including British Isles, North Africa, North and Central America and Oceania among others. My origins tell you which populations you matched against. The breakdown will include the biggest ethnic components in your DNA as well as minor segments. As you go down the list, the percentages of individual ethnic components grow smaller until you get to trace results at the bottom. It means that a certain part of your DNA could not be confidently matched to any existing population. This could be because either the segment matches multiple populations or doesn’t match any population at all. 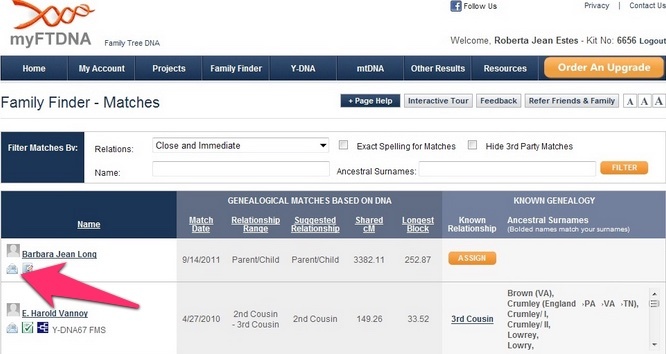 There is also another tool in Family Finder called ancient origins. It matches your DNA results with DNA discovered at archeological sites around the world. Simply put, ancient origins tell you how much of each of three ancient European groups you carry in your DNA. The three groups are Bronze Age (Metal age invaders), Neolithic Era (farmers) and Mesolithic and Neolithic eras (hunters and gatherers). Once you are done looking at your ancestry, you can dive into the family matching tools to discover unknown relatives. FTDNA provides even more extensive information in their mtDNA, y-DNA and other tests. If you need help interpreting the results, they have several guides available. There is also a forum you can participate in as well as occasional webinars to learn more about ancestry genetic testing. You’ll note that in the previous section on test results, I have focused heavily on ancestry reports. But that’s not the only thing available on each service’s dashboard. All three provide tools with which you can search for potential family members and connect with them. 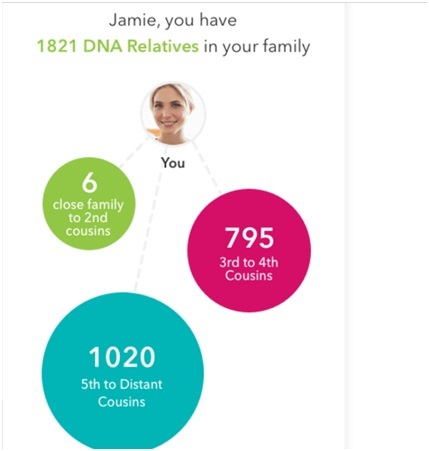 Before you can connect to any relatives, 23andMe first shows you the number of DNA relatives you have around the world. These matches are retrieved from their database of 2 million individual DNA test results. You can see how the relatives are split among immediate family members (parents, siblings and first/second cousins), close relatives (third to fourth cousins) and distant relatives (5th cousins and upwards). If you want to find out more about these relatives and connect with them, you need to opt for the relative finder tool. As long as someone has also opted into the tool, you can see some of their details including what kind of familial relationship you share (e.g., sister, second cousin, third cousin, etc.). To help you connect the dots of your extended family tree, AncestryDNA provides two features: DNA Matches and DNA Circles. DNA Matches is a list of people in AncestryDNA’s database with whom you have a DNA connection. It could be your father, sibling or cousin. You will be shown the level of relationship you share with each of these matches. You can click on a match to find out how you are related and send them a message if you are interested in learning more about them. If they have a public family tree attached to their account, you can also view the DNA circles you have in common. This brings us to the second family-building feature: DNA Circles. DNA Circles are collections of DNA matches that descend from a single ancestor. If two or more of your DNA matches have a similar ancestor, you all belong to one DNA circle. More members will be added to the circle as more people take DNA tests and are also discovered to have the same ancestor. DNA Circles provide a broader view of your family, both present and ancestral. They can be especially helpful when you are tracing your family history back several hundred years. Note that your family tree must be public and linked to your DNA results for you to be included in a DNA circle. Your DNA matches must also meet similar requirements to appear in a circle. When you receive your FTDNA results, look for the Family Finder Matches page. It contains a list of all DNA matches found in FTDNA’s database. For easier viewing, you can filter the list by name, relations, sort by and surname. Under the ‘Relations’ and ‘Sort by’ filter options, there are several other sub-options to narrow your list even further. With the ‘Name’ and Surname’ options, you just need to type a specific name or surname. Only matches with the specified name or surname will be displayed. You can also choose to view matches on just your mother’s or your father’s side only using the parental sort tabs. To activate this option, you must have linked at least one maternal and one paternal DNA match in your family tree. You can go deeper and study exactly how your DNA compares with that of your matches using the chromosome browser. This tool is a bit complicated to use, although FTDNA provides a tutorial. I recommend it for those who have some knowledge of genetics. But anyone can also use it after reading the tutorial and understanding the basics. 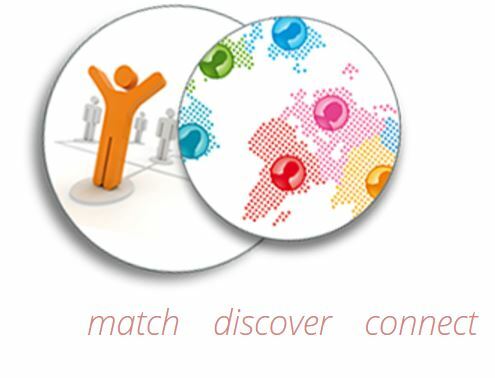 Two other comparison tools are ‘In common with’, which shows you other DNA matches you have in common with a specific match and ‘Not in common with’, which displays matches you do not share with a specific match. Obviously, you need to select at least one match to use these two sorting tools. Finally, there is the Character Card which aggregates all the most important information about a selected match. You can quickly view details such as name, picture (if there is one), level of relatedness, email address and the type of tests the match has taken. Needless to say, FTDNA is the most comprehensive family matching tool among the Big Three tests we’ve reviewed. They provide a trove of information and tools that honestly can be a bit confusing for someone dabbling in genetics for the first time. Thankfully, their educational information is well organized, and you are guided along by tutorials and quick tips at every turn. Also, there are active forums where you can get help with your family quest. This is a sensitive issue for many people planning to get a DNA test – and understandably so. Your genetic data reveals a lot of personal information. For instance, even though FTDNA and AncestryDNA do not provide health analysis with DNA test results, your raw DNA data can still be used later on to determine if you are at risk for certain genetic diseases like Alzheimer’s and Type 2 Diabetes. Another thing that many people don’t realize is that your DNA matches can be a privacy risk, because you share certain traits. If your match’s genetic data got into the wrong hands, someone could use it to determine whether you are a carrier for a distinct disease. There is also the risk of discrimination by insurers or at your work place based upon your genetics. Thankfully, there are state and federal laws in place to protect you against such discrimination. The most important one is GINA (Genetic Information Nondiscrimination Act) although it does not offer full protection in all cases. All of this shows just how important it is to go into DNA testing with your eyes wide open. Your DNA data is extremely sensitive, personal stuff that you need to maintain rights over. Read the terms and conditions of ANY DNA testing service to learn about their data privacy, data sharing and data retention policies. Below, we are going to summarize these for each service. When you decide to go with one, I encourage you to read the fine print in full. It’s tedious but necessary. Essentially, they promise that your personal information and genetic data are stored under airtight security. In fact, your identifying information and DNA data are stored separately, with your genetic data being identified by barcode only. This makes it hard for any malicious person to link your genetic data to your name and other personal details. Furthermore, you have full control over whether your saliva sample is stored after testing, whether your account is visible to other 23andMe members and whether you will participate in the relatives matching tool. You can decline or consent to any of these, at any time. 23andMe also allows promises to ask for your permission to use your data for research purposes with third parties. They say the data is stripped of personally identifiable information, but if they ever need to use your details, they will ask for permission before they do it. As with 23andMe, AncestryDNA’s data privacy relies a lot on your permission. You have full control over who sees your data. For minors, a parent or guardian has full control. You can invite other people to become viewers, collaborators or managers. A manager has the same level of control as the owner of the account. See AncestryDNA’s website for a full explanation of each role and how you can assign them. Other privacy settings include ethnicity sharing settings (limits ethnicity details that are visible by your matches), display name (display real name or username) and Family Tree settings (setting it private or public). AncestryDNA also has a research project where the collect genetic data such as ethnicity, family history, genotype and other details. This project is voluntary. You can join by agreeing to the Informed Consent, and you can also withdraw at any time. FTDNA sends along a release form with the test kit. While they say that signing the form is optional, you will not be able to access many of their services including relatives matching without signing it. By signing it, you agree that your name and email address and selected genetic details will be shown in your matches. You can add more privacy settings to your FTDNA account. For instance, you can restrict matching, meaning only certain types of matches can see your profile. They are shown your last name only. Regarding research, FTDNA policy is to ask for your consent each and every time your data is needed for research purposes. They will tell you who is involved in the research, what it is for and what kind of information will be required. This is in marked contrast to 23andMe who request a single blanket consent for all research projects involving your data. You are not a genetic expert. You simply want to find out about your ancestry and connect with unknown relatives. 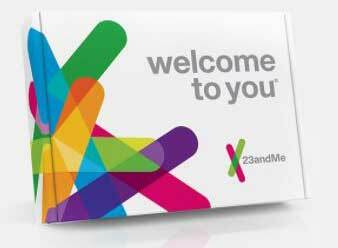 23andMe is also ideal for those who would like a DNA health test in addition to the ancestry one. I also recommend it for those who want more privacy. 23andMe has the tightest privacy controls of all three services. Although it can be frustrating to those looking for matches, it is perfect for those who want to maintain anonymity. You want to research your family tree in depth. AncestryDNA has the largest database of potential matches, which means you are more likely to find matches here than with any other service. It is also worth noting that AncestryDNA is part of Ancestry.com, the longest family history, and genealogical website. They have additional resources including historical documents that might help you in your search. You want to go beyond the basics – or need the strongest confirmation of your DNA history. FTDNA provides plenty of tools to dive deep into your genetic data and uncover more details than a basic report will tell you. That’s why FTDNA is far preferred by professional and enthusiast DNA genealogists. FTDNA is also the best choice if you want to upload your raw genetic data sourced elsewhere such as 23andMe or AncestryDNA. Most excellent report. Thank you for your hard work and attention to detail. This is remarkably good information needed to make an informed decision on genetic testing. According to the FTDNA website, I can upload raw data from either 23andme or Ancestory for $19. So is there any reason I should buy directly from FTDNA? Definitely: if you care about proving a family relationship or verifying a DNA match, FTDNA has the best tools (by far). Great info thanks ! I’m going with Family Tree DNA.